Light Drop Weight Tester “TERRATEST 4000 STREAM” is ideal for testing the bearing capacity and compaction quality of soils, in areas such as road construction, earthworks, pipeline and cable works, backfills, airport runway/taxiways, dam construction, railway track beds, embankments and foundations. The Light Drop Weight Tester for dynamic load plate test is extremely suitable for construction sites. A large window combined with an external control button enable working with a closed box, keeping the electronics protected – even under the most extreme conditions on site! All measurement results are stored on a USB drive. This ensures comfortable archiving and analysis on your PC using the included software “TERRATEST 2.0”. 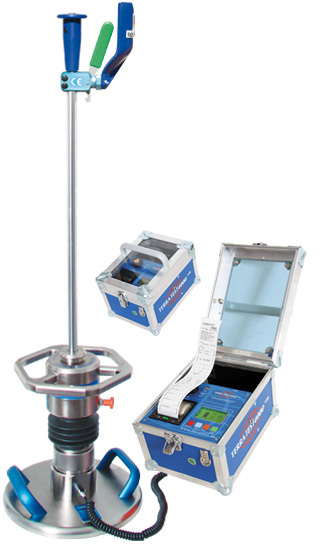 The Light drop weight tester “TERRATEST 4000 STREAM” with cable connection and voice navigation excels through its unbeatable equipment and sensational price performance ratio. The device is particularly popular due to its user-friendly handling. After a short instruction even nonexperts are able to determine within two minutes the compaction quality at the construction site. The measurement electronics are equipped with a printer, GPS system, USB flash drive as storage medium (no SD card), and a graphic display. All components are being supplied by a central, powerful, rechargeable highperformance battery. The weatherproof electronics box protects the measurement electronics even at rough site conditions. Thanks to a large inspection window the electronics can be operated with the lid closed via an external button during the test. The measurement electronics of the “TERRATEST 4000 STREAM” have undergone a test regarding the IP protection classes. The test provides insight in terms of under which environmental impacts the test Computer withstands water and dust permanently. The suitability of the devices for outdoor use has been confirmed by their protection level which has been classified as IP 53. “TERRATEST 4000 STREAM” was certified recently with the TÜV GS mark by TÜV Rheinland. 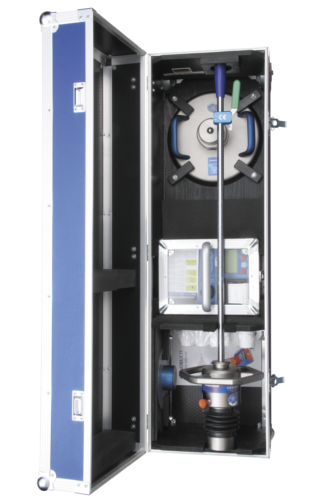 The Light drop weight tester is produced in Germany. All quality and safety standards are being met verifiably. Control your Light Drop Weight Tester easily with smartphone or tablet. 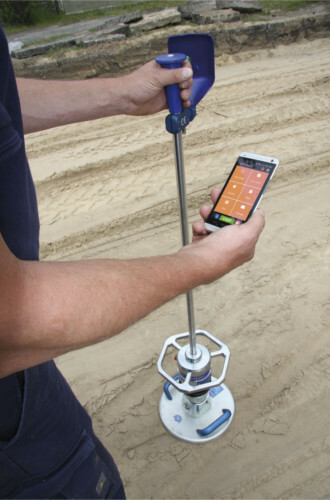 TERRATEST 6000 BLE is the world's first Light Drop Weight Tester using app for Android iOS on construction site. TERRATEST offers calibra- tion, repair and service for all devices. 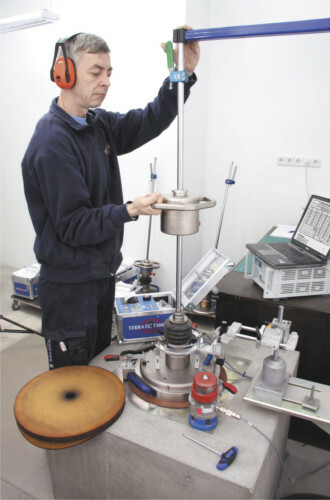 We perform calibration according to German standard TP BF StB, Part B 8.4 and international standard ASTM E2835-11. TERRATEST manufactures the Transportation box MILANO to guarantee a save trip. For convenient handling the box is equipped with wheels. The new Light Drop Weight Tester TERRATEST 4000 STREAM was developed on the basis of TERRATEST 3000 GPS, the best-selling model of the last three years. It was presented for the first time at the BAUMA 2013 in Munich. All components, such as GPS system, printer, graphic display, buttons, powerful rechargeable battery, and USB drive, are compactly fitted into the electronics box “ROBUSTA” to always guarantee an easy handling on site. 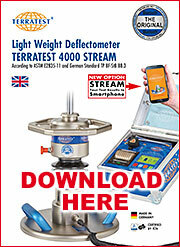 Light Drop Weight Tester TERRATEST 4000 STREAM uses a USB drive for comfortable transfer of the test data to a PC. With the included software “TERRATEST 2.0” the evaluation of the test data is absolutely easy. It enables you to present all test sheets in a professional way.